UltraLight In size Large, the jacket weighs 6.05oz, and the pants weigh 4.50oz. 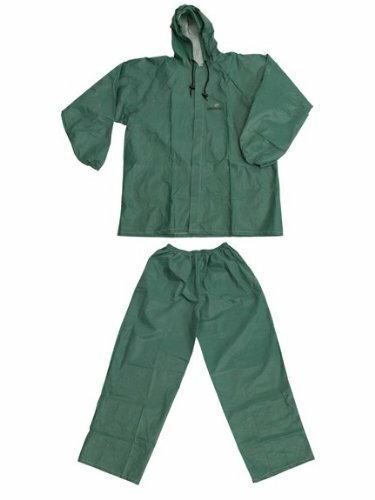 Do you know of any other rain suit that comes close to that weight? Breathable Made from microporous polypropylene, this suit is by far the most breathable I have ever used. This is a huge plus when using the rain jacket as a wind shirt, which I would compare it to for breathability. Simple The pocket free design keeps things simple and lightweight. The pants and bottom of the jacket also lack a draw cord, which I typically remove any way. Durable This is where this product is really lacking. If you are going to be bushwhacking, this is not the rain suit for you. It's also why this is not a product review, but a first look. Time will tell how long it will last. Fit I usually wear a size XL, but I got this in a Large and it fits me perfectly. They have supposedly made this to fit over insulation layers, but they have gone over board in my opinion. Buy it a size smaller than normal and it should fit you fine. I know, I know...I'm always talking about making my gear more durable without adding any weight, so why would I consider using something that looks like it won't last a few weeks let alone a thru-hike? First and foremost, the breathability is outstanding. Second, the weight is also a big advantage. So what if I'm on a 2 week trek and get a hole? Duct tape sticks very well and would repair a small hole just fine. For 20 bucks, I think it's a great deal. Get yours here at the Mountain UltraLight Store.